For 25 years, at Kye's and Kye's II, we have been providing the perfect combination of style, elegance and fun for our clients. From creating the perfect day for hundreds of brides, to the perfect event for hundreds of businesses and organizations, we've worked hard to make sure that each occasion comes off perfectly. It has been an incredibly rewarding, exhausting, exciting and invigorating 25 years. I have been blessed with a great staff, and I simply can't count the number of cherished friends I've made over those years. It has been everything I dreamed it would be, and so much more. And so it's time to say goodbye. 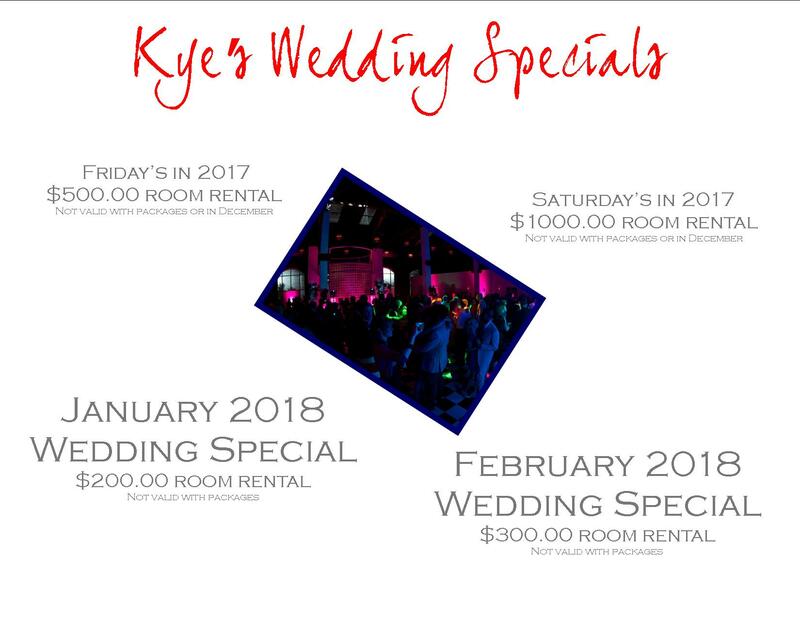 As of December 31, 2018, Kye's will close its doors for the last time. It was a difficult decision, and certainly a bittersweet one. But it's the right time for me to close this chapter, to end on a high note and move on to the next adventure. I'm so very proud of all the things we accomplished. I'm proud of my staff, who worked so diligently every day for every client. I'm proud that so many brides were willing to entrust their special day to us. I'm proud that so many companies and organizations selected us for important events. I'm proud that we were able to give so much back to the community through hosting fundraisers and other nonprofit functions. And I'm proud that, in some small way, we've changed this business. When we began twenty-five years ago, there were very few elegant settings for a bride to choose from. In the years since, many new venues have emerged in our wake to offer a similar, stylish setting for special events. So we leave knowing that part of our legacy is a greater range of choices for anyone looking for a truly special setting in the metro area. Thank you to everyone who has made this dream possible. Thank you to all of our staff, our clients, our vendors and our friends. It has been a long, wonderful ride. © Copyright 2010 Kye's, Inc.